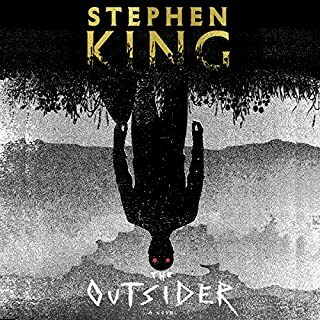 The Outsider plunges you into the most horrific crime imaginable at the very beginning and keeps you guessing until the very end. True to Stephen King, humans are not always who they seem to be and evil can possess any shape. The performance by Will Patton is outstanding. His voices fit every character, are realistic, keep you in the storyline, and most importantly are consistent throughout the entire story. His voice for Holly is good but maybe a little too halted and computer like but it is not enough to take you out of the story and after awhile you get used to it. WARNING: There is character cross-over from Mr. Mercedes in this book. If, like me, you are watching the TV series and have not yet read (or listened) to the book there will be some spoilers for you as the characters do refer back to events that happened in Mr. Mercedes. This is the first of the Jane Hawk series. The story is excellent with just enough excitement and twists to make you want to keep listening way part your bedtime. The narrator does an above average job. I really enjoyed her narrative voice and her voice for Jane. One of the first male characters Jane interacts with is a computer hacker and the narrator voice captures the "teen" attitude and ego. However, for the most part (aside from the one British accent) all male characters have the same "attitude" and clipped sentence cadence that made sense for the hacker but not for an FBI agent or a lawyer. It did distract me out of the story a bit but not enough that it was too hard to follow who was talking. Has Funny Amazon Reviews turned you off from other books in this genre? I will not be activily seeking out books in this genre anytime soon. I have seen MUCH funnier reviews shared on Facebook and other social media. 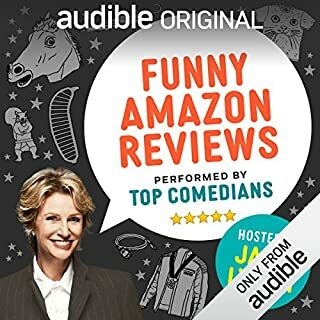 What three words best describe Jane Lynch’s voice? Jane Lynch played her part well. I had no problems listening to her. If I was a passenger on public transportation and did not want to laugh out loud to draw attention to myself, this was the perfect book to listen to. There were 2 or 3 spots that made me smile but nothing was so funny as to elicit a laugh even though I was listening alone at home. When I first started listening I thought, am I going to be able to listen to this guy for 50 hours? But as the story develops, his accents and different voices for the characters really bring them to life. When we first meet Tom Cullen the narrator gives him a Gomer Pyle voice which pulled me out of the story. I've never thought of big Tom Cullen having a voice like that!! The producers must have had second thoughts too because later in the book it is a much different voice, a much better voice. 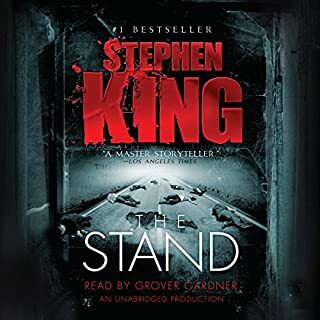 This is one of my favorite books by King so I'm sure I'll be listening to it again sometime in the future. Cameron Belerle performs awesomely. 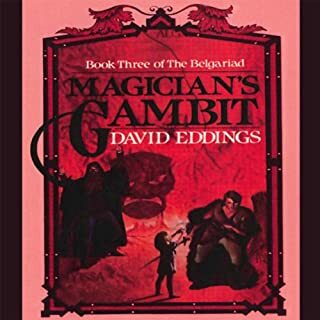 His consistency of voices throughout not just this book but the series of books makes the characters easy to follow and identify. Gareon discovers that he not only has power but will be required to use it in the upcoming battle. The prophecy continues to unfold and members are added to the group. A visit to the Vail and the home of Grandfather is eye opening for Gareon. 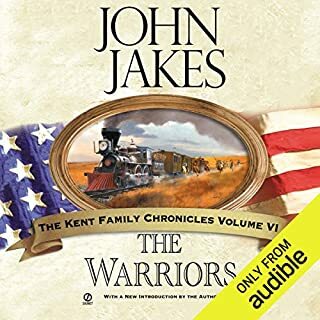 The definitive volume in Jakes’s best-selling series finds the Kent family reaching to finally embrace its legacy - and its futureIn the final installment of the Kent Family Chronicles, the remaining Kents seek to fulfill Philip Kent’s original American dream. As Gideon Kent’s health deteriorates, he fears for the future of his family. BOOK: (Amazon Summary) The Kent Family Chronicles conclude with Gideon Kent in failing health and his heirs unready to uphold the family legacy of service when their country needs them most. NARRATION: Marc Vietor narrates the entire series which is a plus. I like the consistency of hearing the same voice throughout the story line. The voices are well done, female and male are easily distinguishable. 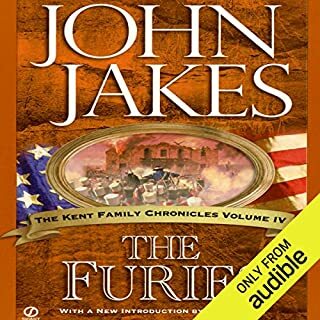 The penultimate volume in John Jakes’s stirring Kent Family Chronicles finds America booming in its postwar prosperity. With this newly secured peace comes an opportunity for the Kent family to reconcile and to thrive, both personally and financially. Gideon Kent takes up his father’s vow to reunite the family, but when he brings his father’s widow back into the fold, the repercussions seem insurmountable. BOOK: (Amazon Summary) In a flourishing post–Civil War America, the Kent family seizes good fortune again—until all is suddenly threatened by one woman’s return. The penultimate volume in John Jakes’s stirring Kent Family Chronicles finds America booming in its postwar prosperity. With this newly secured peace comes an opportunity for the Kent family to reconcile and to thrive, both personally and financially. Gideon Kent takes up his father’s vow to reunite the family, but when he brings his father’s widow back into the fold, the repercussions seem insurmountable. Against the backdrop of a recovering nation, the Kents face dramatic challenges and unexpected rifts that could leave the family shattered for years to come. 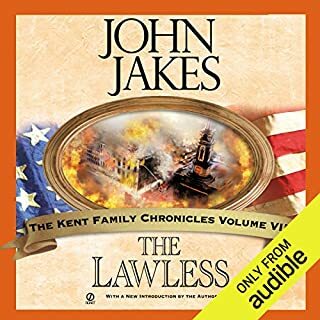 This addictive John Jakes adventure blends the Kents’ ruthless push for an empire with murderous betrayal and the Civil War’s life-altering culmination. With the Civil War reaching its gory climax, the divided Kent family is pushed to the edge of complete destruction. With the advent of the transcontinental Union Pacific Railroad, the Kents continue to fight for their foothold among America’s wealthy founding families. While their private, insular war rages, young Jeremiah Kent is tempted by a calculating Southern belle into a trap of deceit, lust, and murder. What made the experience of listening to The Warriors the most enjoyable? BOOK: (Amazon Summary) The Kent Family Chronicles Book VI; The glittering saga of our America-and the people who made her great. As the Civil War draws to its inevitable climax, The Warriors carries the turbulent chronicle of the divided Kent family to far-reaching new battlefields. A gracious Southern plantation ravaged by Union soldiers as the blacks cry for "Jubilee"... the bright trail westward blazed by the Union Pacific Railroad, and its lusty Traveling Towns and savage Indian raids...the plush eastern mansions of the Robber Barons-Gould, Fisk and drew...the seething conclaves of the new trade unions-these are the scenes of a nation's rebirth and of the Kents' private, impassioned wars... These are the backdrops as well for stirring romantic entanglements. When young Jeremiah Kent is tempted by a lascivious Southern belle into a web of lust and murder...and Michael Boyle longs for a lovely immigrant girl, Hannah...the destiny of the Kent dynasty is set on an irreversible course into the great American future. When Jephtha Kent leaves his family to go north, the Kents come under the influence of Louis, the most opportunistic son. While the nation splits on secession and slavery, the Kents nearly fall to greed and self-interest. The Civil War divided families and friends and left wounds some of which are still not healed. That the Kents survived was a miracle: that they came through with vigor intact held great promise for the rich decades that lay ahead. 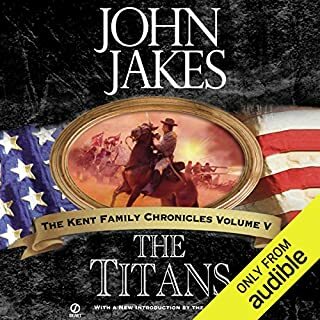 The Titans is the fifth volume in the Kent Family Chronicles preceded by The Furies. Would you consider the audio edition of The Titans to be better than the print version? In the hellish years of the Civil War, the Kent family faces its greatest trials yet. Louis, the devious son of the late Amanda Kent, is in control of the dynasty—and of its seemingly inevitable collapse. His cousin Jephtha Kent, meanwhile, backs the abolitionist cause, while his sons remain devoted Southerners. As the country fractures around the Kents, John Jakes introduces characters that include some of the most famous Americans of this defining era. Spanning the full breadth of the Civil War—from the brutal frontlines in the South to the political tangle in Washington—The Titans chronicles two struggles for identity: the country’s and the Kents’. 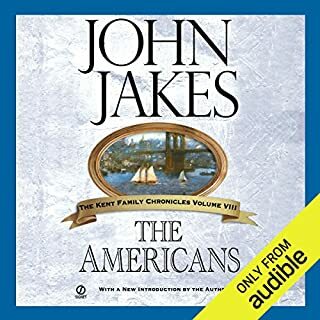 The Kents' saga expands as its first heroine takes center stage in the relentless struggle to build the family dynasty opening twenty-two years after the events of The Seekers, John Jakes's fourth Kent Family novel spans the blood-soaked era of America's relentless expansion into the West. Amanda Kent, daughter of Gilbert Kent and Harriet Lebow, is one of the few women to escape the massacre at the Battle of the Alamo. What did you love best about The Furies? Opening twenty-two years after the events of The Seekers, John Jakes’s fourth Kent Family novel spans the blood-soaked era of America’s relentless expansion into the West. Amanda Kent, daughter of Gilbert Kent and Harriet Lebow, is one of the few women to escape the massacre at the Battle of the Alamo. Uncommonly brazen and focused, Amanda seeks to make a new life for herself by restoring the Kent family name. Her efforts to build a dynasty take her to northern California, just in time for the Gold Rush.